I am a big fan of Jazz guitar and so I need no arm twisting to get me along to a Jazz Guitar gig. Last Wednesday the CJC featured a local guitar trio (+ piano in second half). I was not previously aware of ‘Trio White’ and so I was intrigued. I soon learnt that this band knew exactly what they were about as they launched into the first set with fiery determination. From an overheard conversation I learned that they had been keen to play at the CJC for a while and were hungry to play in front of more Jazz audiences. They have been together for a while and according to their promotional material formed in order to explore the most contemporary sounds of Jazz. On Wednesday the group performed their own material, but they do mention Kurt Rosenwinkel as an influence and I am not surprised. While they treated us to some slower and more melodic numbers, the main thrust of their music was intense hard-driving; blowing jazz. Their was no mistaking that Ben White was the leader and he worked the band hard as he executed his rapid fire runs up and down the neck of the guitar. He also demonstrated some skillful chord work and comped when the bass took a solo, but the thrust of this hard-driving music came from the intense lines he tossed out. It was hard to catch the song titles as the band did not pay terribly much attention to introducing tunes. They began by launching straight into the music and only brief announcements followed; almost as an aside. They were primed to play and that was all that mattered. For the second set they were joined by Dr Stephen Small on piano and as you would expect a slightly more reflective vibe took over. Having a piano added to a guitar trio changes the dynamic and the musicians have to be more aware of creating room for each other. It can also free up a guitarist, as chords are less of an issue to be factored into the mix. One number I did catch the title of was the ironically named ‘Untitled Tune‘. For me it was the best number of the evening. I loved it from start to finish – thoroughly enjoyable music. The band communicated as a unit and were more aware of each other; responding in the best possible way to the challenges being laid down. Following that was a slow burning groove number with a walking bass line that drove the tune relentlessly. Joanne Shum held the centre and for this one track she and drummer Steve Harvie ruled the roost. Dr Stephen Smalls piano was excellent as well and he did exactly what was expected of a pianist joining a piano trio. 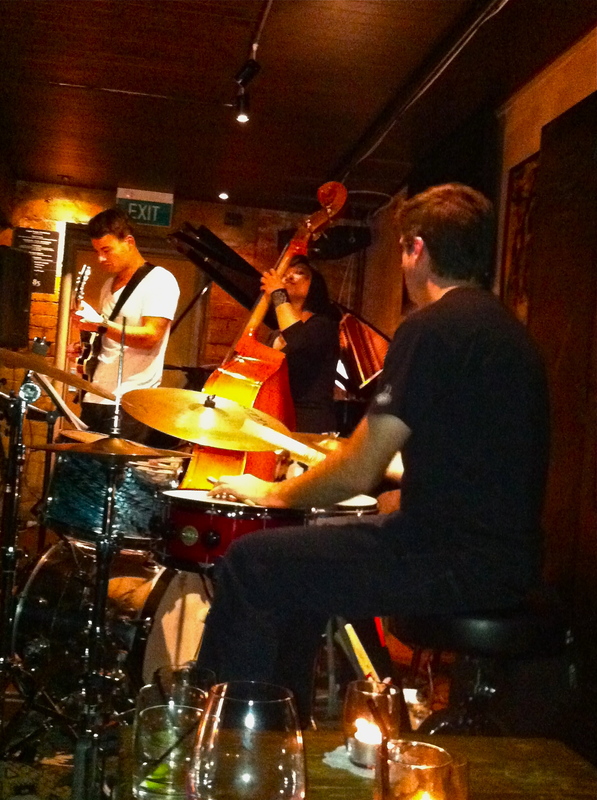 In last weeks blog I speculated that this might well be the golden era of Auckland Jazz. If that is the case then it is down to this CJC Jazz club and the dedication of Caroline, Roger, Ben and the others who work at this so tirelessly. Keep them coming please, the magic is apparently endless.